NBA commissioner David Stern is one of the may stars to come out of the powerful law firm Proskauer Rose. There are a handful of law firms that strike fear in the sports world. None, though, is quite like Proskauer Rose. The New York-based firm has represented all of the major sports leagues -- NBA, WNBA, NFL, NHL, Major League Baseball and Major League Soccer -- produced two commissioners (David Stern and Gary Bettman) and trained a legion of attorneys to outmaneuver players' advocates. Many Proskauer attorneys eventually work for leagues, teams or key companies in sports. To the extent professional sports connects to one law firm, it's Proskauer. Proskauer's path to sports prominence began modestly in the early 1960s, when attorney George Gallantz took on a relatively small client called the NBA. This was a much quieter era for both sports and sports law. With few exceptions, owners were not billionaires and players were not millionaires. Television contracts were in the seven figures, not 11 figures, and technologies like cable television, video games and the Internet were decades away. Leagues and owners also called the shots: owners imposed rules rather than collectively-bargained them, and most players negotiated contracts without an agent. As the NBA grew rapidly and as its legal relationship with players became more complex, Proskauer's sports practice added clients and influence. Although firms do not "draft" students out of law school -- students can sign with any firm that offers them a job -- Proskauer's 1966 rookie class of sports attorneys became legendary. 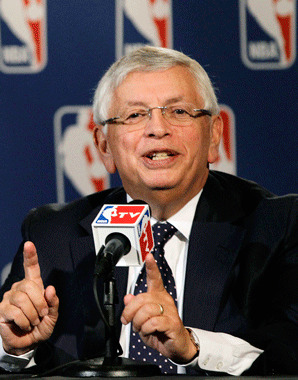 The leader was 25-year-old Stern, who ascended quickly before the NBA hired him as general counsel in 1978. A 24-year-old Robert "Bob" Batterman was another young Proskauer star. Decades later, Batterman would become a polarizing figure. Like any law firm with decades of cases, Proskauer has lost its fair share. To settle an antitrust lawsuit brought by Oscar Robertson, the NBA -- with Stern as lead outside counsel -- allowed players to become free agents in 1976. The league has never been the same since. Players, by being able to get multiple teams to bid for their services, would thereafter command considerably more money from owners. But Proskauer usually wins. Some major victories included major antitrust litigations involving the Association of Tennis Professionals and MLS. And its legal strategy of advising leagues to lockout players unless they accept league-friendly terms -- a strategy that produced NBA lockouts in 1995, 1996, 1998-99 and 2011, NHL lockouts in 1994-95, 2004-05 and 2012-13 and the 2011 NFL lockout -- has proved remarkably effective, at least for owners. Without these lockouts, players might have avoided significant cost controls. Lockouts have also "worked" because players have failed in antitrust litigation to stop them (Tom Brady et al. v. NFL). Proskauer's lockout strategy has banked on favorable labor law and on timing: antitrust litigation often takes years. This lengthy process may be too long for players, especially with few opportunities to earn substantial income elsewhere. While impressively strategic, Proskauer's lockout strategy has proven disastrous in other ways. The three NHL lockouts, for instance, resulted in the cancellation of about two seasons worth of regular season games. Many local businesses suffered immensely, as did their employees and customers. Players' distrust of leagues, and to some extent teams, has also escalated because of lockouts. Lockouts are also arguably abusive or at least opportunistic, since they take advantage of a legal process not well suited for resolving labor disputes in pro sports. Nonetheless, by forcing players to agree to employment terms mostly favorable to leagues, the lockouts have likely made billions of dollars for Proskauer's paying clients: leagues. Therein reveals why leagues frequently turn to Proskauer for legal counsel and why they frequently hire Proskauer attorneys for executive positions: the firm fundamentally understands that sports is a business and that owners own that business. What would sports look like today if the NBA used a different law firm from Proskauer in the early 60s? What would they look like if Columbia Law School student David Stern accepted an offer from another law firm, perhaps one in a different city? It's safe to say it would be quite different. Michael McCann is director of the Sports and Entertainment Law Institute at the University of New Hampshire School of Law and the distinguished visiting Hall of Fame Professor of Law at Mississippi College School of Law. He also directs the sports law program at Vermont Law School.